"I never think about art. And I don't think the old masters ever thought that they were creating art. " This documentary is an American treasure. As funding for school arts programs dwindle, and the Governor of Minnesota wins on a platform that annihilates the coffers of Public Television, the American Masters series on DVD is as important an archive as the treasured "Prints and Drawings Room" of the Art Institute of Chicago. True, I once held the matted edges of an original Rembrandt in my hands there—there was a time one could request and do such a thing—which supercedes any other experience, such as viewing a documentary...but those days are gone, Man Ray is gone, and what we can have is this American Master, in his own words, remind us that his contribution to the history of modern art and thought, is a terrible thing to waste. Emanuel Radnitsky was an expert draftsman in his youth. He is not remembered as a painter, but he painted. Photography was a means to record his work; then it became his work; ultimately, photography became his art. If he comes off as self-important, we must forgive him because he was our American in Paris, not merely one of our rare emissaries to that belovéd and revered era, but its absolute recorder. He should forgive us for not knowing his accomplishments. Inspired by the now famous Armory Show (1913) that introduced the bold new art from Europe to Americans, Man Ray drew the interest of New York's most respected art dealer, Alfred Stieglitz—but still his work went under-appreciated and unsold. He was later befriended by Marcel Duchamps, the Armory Show's most controversial exhibitionist. At a later show, where Duchamps had his infamous urinal "Fountain" rejected, Man Ray offered what is arguably the first "interactive" painting, a board with 2 bells wired to an electric push button, called "Self Portrait." Man Ray expected the viewer to eventually push the button, thereby "participating in the creation" of the piece. When his interviewer points out that the button doesn't work, Man Ray states simply, "That's what makes it a work of art." He left with Duchamps for Europe, where he became a prominent member of the era's illuminati, those forward-thinkers who expanded the boundaries not only of art, but philosophy, music and literature. His personal and artistic circle included the creative elite from Breton and Picasso to Dali and Tzara. He is the inventor of the Ray-O-Graph, a sort of monotype technique for photographers—one-off images created without a camera—a medium he also used to create the first Dada films. A Surrealist in his later years, he returned to his first love, painting. Considered too outré, he sold very few pieces in his lifetime. Of this he stated, "They say I am ahead of my times, too...I say no, I am of my times, it's the others that are behind." Image Transfer Review: Somewhere along the way someone has taken the time to clean up the original interview footage, both the b&w and color segments. However, albeit clean, the color is obviously Kodak: that ubiqutious bluish cast makes it appear as if the artist "rinsed" his graying hair. I noted no edge enhancements. I really cannot find much to complain about, except that I could not reach in and push the button of his "Self Portrait" myself. Audio Transfer Review: Amazingly clean considering the age and origin of the interview footage. No noticable variances or annoyances. No apparent hiss. Even with Man Ray's thick Brooklyn accent, every word is clearly audible. The score is about what we've come to expect from these PBS productions—a hint of the music of the times would have spoken volumes to help underscore and support the historic relevance of the subject's great accomplishments. Extras Review: The essay by Neil Baldwin is an unneccessary addition that really does not enlighten us with any relevant details of this important man's life. Its presentation as small white text shadowed in black is difficult enough to read—impossible as it flutters and jumps. The documentary states that he "single-handedly pioneered some of the 20th century's most important innovations in the arts." 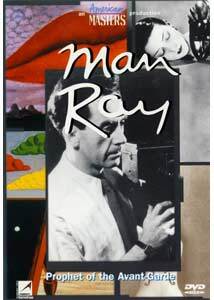 Draftsman, painter, photographer, constructionist, dadaist, surrealist—Man Ray is our "prophet" and this precious film should be an honored element in anyone's archive—students of art, philosophy or history, or anyone who understands the 20th century imperative to preserve our treasures in any way we can.